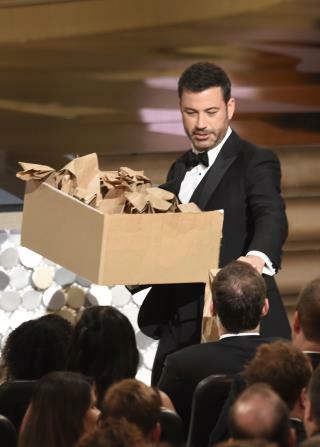 (Newser) – The Oscars finally have a host: Jimmy Kimmel will emcee the 89th Academy Awards. The late-night host will be presiding over the ceremony for the first time. Kimmel has been a regular awards host, having twice previously hosted the Emmy Awards (including its broadcast in September) and once led ESPN's ESPY Awards, the AP reports. The selection of Kimmel gives ABC, home of the Oscars telecast, the choice the network had long sought. His Jimmy Kimmel Live! has previously followed ABC's Oscar broadcast. The network also has new muscle to flex; it signed a deal with the Academy of Motion Pictures in August to remain the Oscar broadcast home until 2028. Trump: "This guy is low energy folks...definitely low energy"